The falls drain 4 of the 5 Great Lakes and the flow is enormous. 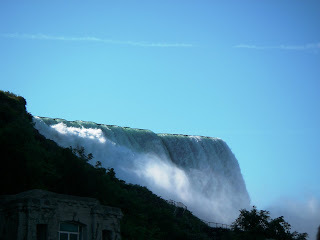 Every second 2/3 of an acre foot of water passes over the Falls. We rode the Maid of the Mist boat which goes as close as possible to the Canadian side of the falls which is known as the Horseshoe Falls. The boat goes into the falls as far as possible given the incredible current from the amount of water. The captain took the boat in until the current stalled our forward progress and the spray from the falls was like rain at that time. 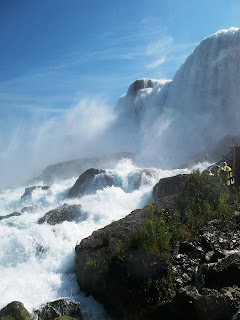 We also went on the Cave of the Winds tour which goes to the base of the American falls. We went to the bottom of the falls and then went up a series of stairs parallel to the falls. The amount of water and the sound of that much water falling was impressive. 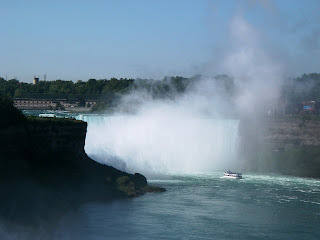 The Niagara Falls are really one of the wonders of the natural world. 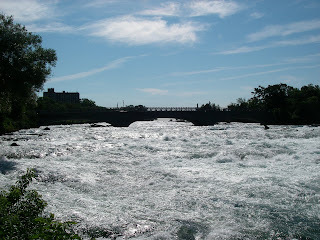 The amount of water flowing over the falls is truly amazing.